I think this is an article that’s been written before, but I doubt everyone has read it, so I’m going to write one. An important part of Magic financial fitness is keeping a liquid collection. What does that mean? Well, a Magic collection is a lot like a plant. If you give it plenty of sun and water it you’ll a pile of soggy unplayable cards, so not in that way. But it’s similar in the fact that with a minimal amount of maintenance it will grow. I assume many of the people that read my articles are not urban gardeners like myself, but there are a few things you can do to grow much fuller herbs. If you give the herb sun and water it, it will grow just fine. If you periodically fertilize and prune the plant it will grow fuller and faster. Pruning a plant promotes new growth and a heartier plant. Your collection acts the same way. It’s pretty much impossible to grow a collection without adding more money into it, but it is possible to re-appropriate that value to help it grow. It’s important to notice trends and to fertilize properly and prune properly. Maybe I’m talking too much in abstract so let’s use some real world examples from my collection. 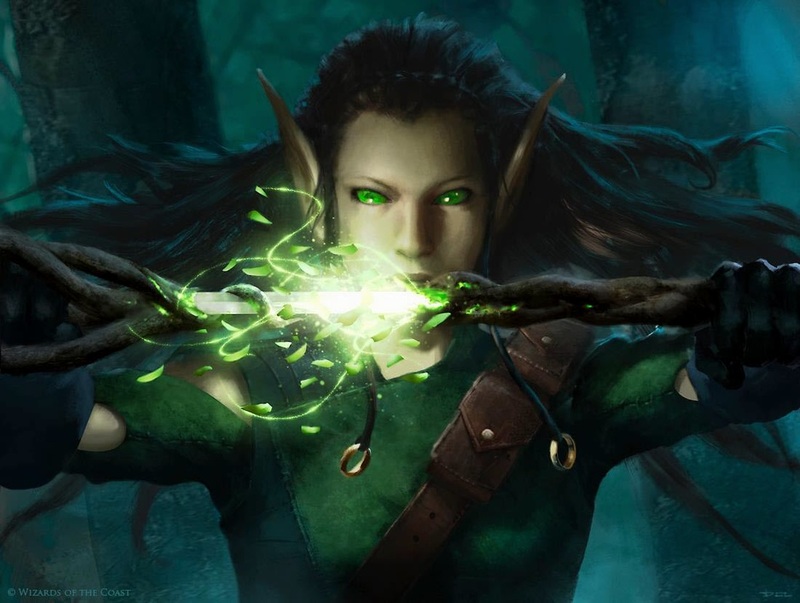 I’ve been pruning my collection of Magic Origins cards that have been popular in Standard. The last few weeks have seen many different decks winning top-tier tournaments and have been affecting prices. I play a lot of Magic so obviously I’m not looking to sell pieces of the deck I play but there are cards outside of that I own that I don’t need. In the last month I’ve sold Demonic Pacts, Woodland Bellower, Jace, Vryn’s Prodigy, Ghostfire Blade, Thopter Spynetwork, and Ensoul Artifact. I’ve also been “fertilizing” my collection with cards that haven’t become a “thing” yet. I got Ghostfire Blades and Abbot of Keral Keep right before they became super popular. Right now I’ve been getting cards that are cheap because cheap cards can become expensive easily but expensive cards don’t get more expensive very easily. Especially with how much Magic Origins product is being opened. As this is now the weekend after a five-Abzan Top 8, I would recommend watching the movement of the staples for this deck. It’s going to be probably the last chance you have to trade away Fleecemane Lion for literal anything. It’s fair trade value is about $2 and if you can flip it into any of the painlands from Magic Origins it is really hard to go wrong. Dromoka’s Command is another card that is surging despite its recent reprinting in the Magic Origins clash pack. Fellow MTGPrice writer Derek Madlem suggested last week that Dromoka’s Command was a criminally underpriced card. Given its play last weekend, I’d say he was right. 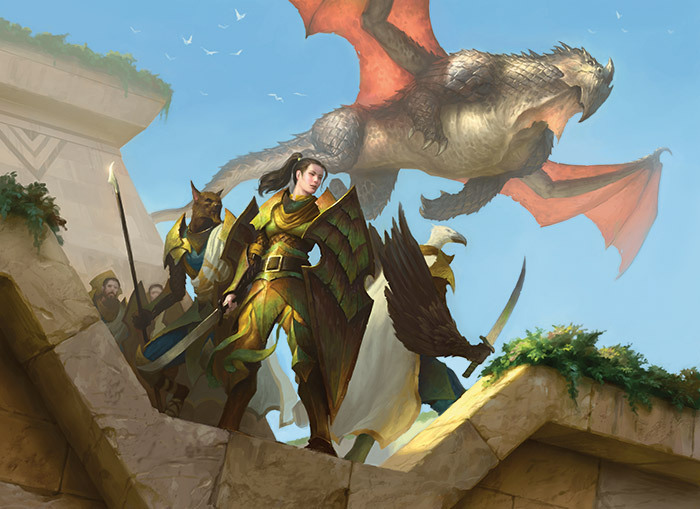 Dromoka’s Command will also survive an extra rotation as Dragons of Tarkir will not rotate with the rest of the block. But do you know what I really like doing now? 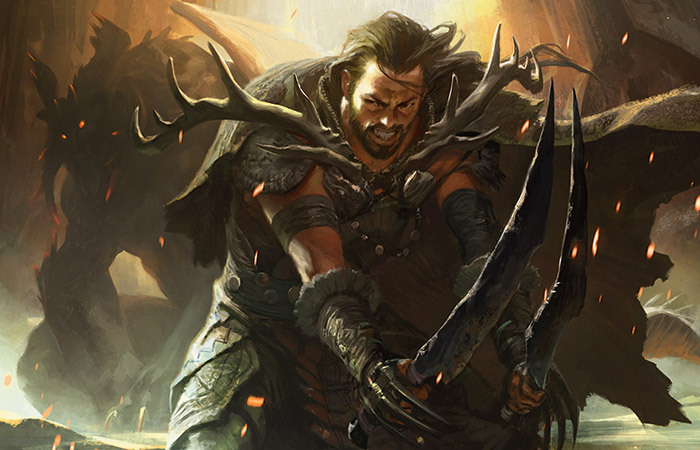 Grabbing all of your Khans of Tarkir staples. There really isn’t a better time to buy Rattleclaw Mystic, Mantis Rider, Savage Knuckleblade, Siege Rhino, or Sorin, Solemn Visitor. 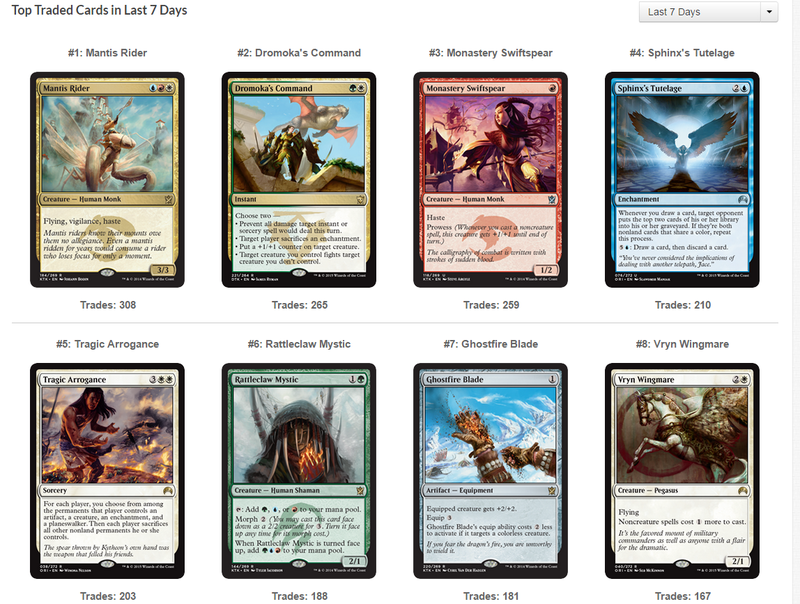 We’ve already seen an uptick of Sorin in response to the abundant UR Thopters decks and Monored decks. Any card that gives your whole team lifelink and is on the same team as Siege Rhino can be good against aggressive decks. Mantis Rider’s price tag of $1 is a pretty safe bet. 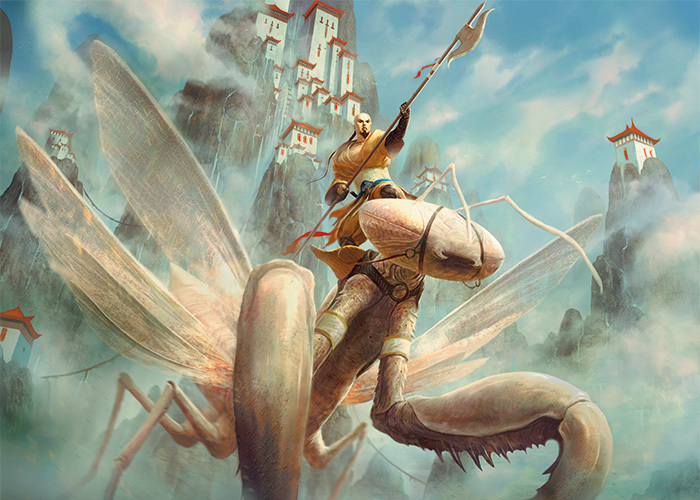 After Battle For Zendikar enters the fray we will be losing our only two-mana spell that can kill Mantis Rider. Surprisingly, Mantis Rider is pretty durable when your options for removal are Ultimate Price, Swift Reckoning, Valorous Stance, and Roast. He can still die to Draconic Roar and Foul-Tongue Invocation but that’s a pretty small subset of available spells. What else do we prune? Card of the week syndrome can hit hard and fast. Next on our list? Keep an eye on new saplings waiting to be planted. Some cards that pre-ordered at the beginning for a lot are coming down to more reasonable price ranges. While there is nothing I’m advocating as a buy today, there are a few cards I would keep a sharp eye on. Sword of the Animist is card that preordered for $5 after being touted by StarCity Games’ Ben Bleisweiss as one of the best cards in the set but now is down to half of that number. Casual appeal should keep this from ever hitting true bulk but with the confirmation of Landfall as a returning mechanic in Battle for Zendikar, this has some legs. It may have some more room to drop but as soon as it turns the corner is the time to buy in. 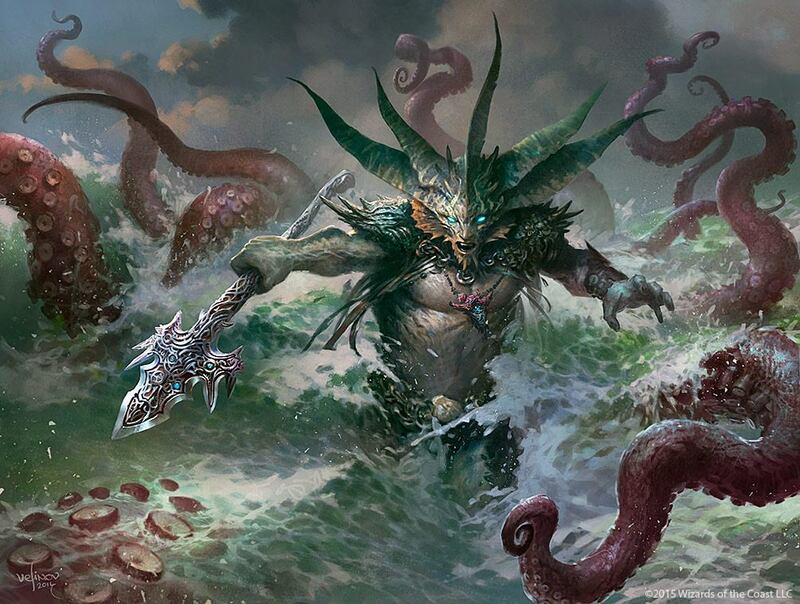 Harbinger of the Tides was another hyped card. If we are expecting Eldrazi that are large and in charge in the next set I don’t see how this guy doesn’t fit into the resistance. He’s a reasonable body attached to a powerful effect versus cards that might have been cheating into play with See the Unwritten. He also still does a decent job of unsummoning all of the Dragonlords except Dromoka at instant speed. He also may have some space to drop but when we approach $1 there is no real risk in buying in. What does Surrak, the Huntcaller do? A ton really. He trades with Siege Rhino, he triggers ferocious for See the Unwritten and gives haste to whatever huge fatty you put into play with it. The art of this card may be more telling of his future with Dragonlord Atarka emerging from his shadow to fly in for a kill. In conclusion, water your collection and leave it out in the sun if you think it’s a plant. Otherwise keep an eye on trends and make sure to move parts of your collection you aren’t using to free up money to invest in parts you will need later down the line. Any reasonable chance that Animist’s Awakening becomes a relevant card in standard? I’m going to pick up some more copies of it. It sure has great appeal to casual players. Whatever I can do to make the reader experience better I will. Would you rather I link the card image instead of the art or provide a link to the image of the card? I like the art itself, more pleasant than the image of the card. But I would agree on the helpfulness of the linking – at least the first time you mention a card in the article, the card name itself should link to the appropriate mtgprice.com page for that card/set. I can definitely so that. Thank you for the feedback! Have you tried something like AutocardAnywhere on Chrome or a similar plugin? I love surrak. 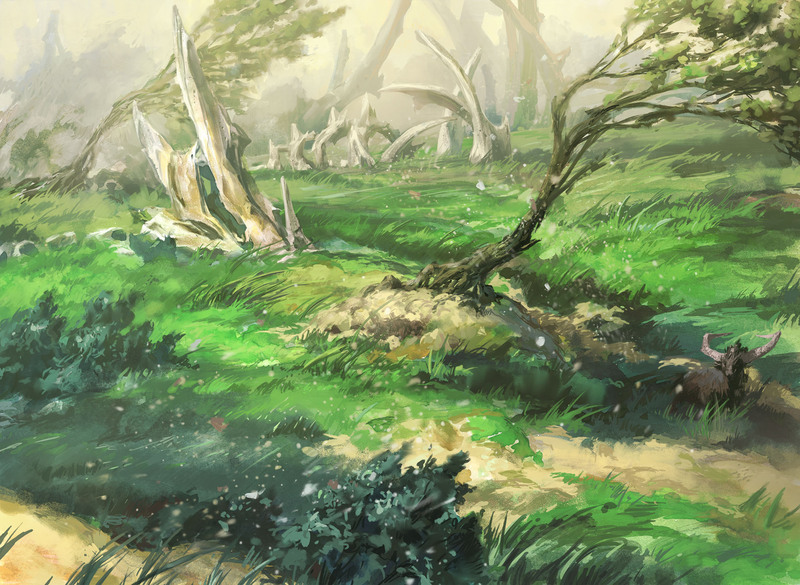 People quite often forget that he can give himself haste, as well as any creature that hits the battlefield after him. All it takes is a den protector and elvish mystic or a single deathmist raptor or avatar of the resolute to slam down surrak with haste. 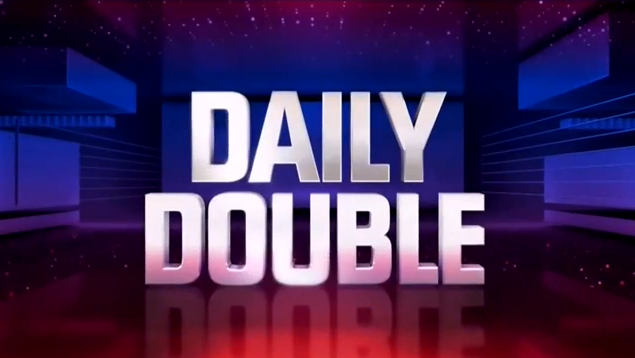 Languish is a sorcery so you can potentially swing in for 8 before they can even cast it. I’ve been personally messing around with hangarback walker and avatar of the resolute + surrak the hunt caller in a den pro + raptor + dro co setup. Surrak always has haste when he comes out. Anything after that is just win more in my opinion, at least in my deck. Even if they do languish… Just hold a den pro back and megamorph cast it on turn 5 and grab surrak. Then cast him turn six and he gives himself haste again. Raptors hitting the board are just a bonus and if you have a dro co or any other spell in hand you can pretty much just win right there.